@kristin=-yes, answering the phone-completely forgot-good point! @patricia and @daryl-agree on cooking-it makes me really nervous, tho. (And I still can’t sew a button worth beans…) @Mara-we started the shower thing about a year ago with both kids-10 year old is completely on his own and 7 year old is getting there…that was a biggie (and a huge relief as I was really tired of baths after all those years…) thanks all for chiming in! I would add in the work in progress – how to sew on a button, in the USA how to reset the plumb ball in the toilet, ( how to mop up the floor if necessary) how to re-track a zipper, and definitely start to budget and learn about parental values and how to use money….even with some make some money ideas. By age 12, I think it is important for folks to understand how to cook a meal for themselves, because they are going to be doing that for a very long time in life – and even if they don’t do most of the cooking chores…knowing how it vital for a healthy life. My Mother had us memorize homemade mac and cheese and a basic sponge cake….My husband took this on…and on his last 3 week bike tour, he was able to whip up a blackberry cobbler in a small box oven on the fire pit….One never knows? As previous responder — 2 things I failed to teach at the appropriate times & 10 is a good age: (1) basic money skills, including reasonable & unreasonable pricing, safety about money, basic budgeting, etc. (2) Cooking — actually, these skills should be gradually introduced earlier. Always was remiss about this myself. I actually didn’t appreciate just how remiss until I saw some of my grandchildren at 6-8 quite capably handling basic cooking. Starting with sweets is always popular. Taking a shower on their own. Diego 8 years, already does…though I’m all around most of the time checking, but he doesn’t notice. Going to school alone. I know, I know, that can be unthinkable in the U.K. or in the U.S.A, but here even though it is not so usual as it was along my kid times, it’s a kind of must that we, parents, might encourage our kids to do, isn’t it? Doing their homeworks entirely by themselves with no help from parents. For me this is really crucial. I know many couples around me, who they STILL help (if not do them) with their TEENAGERS’ homework from Highschool (even with nearly 18!!). This is totally wrong as what will those teens do then at University far from their protectors or slaves? Ohh, I forgot to comment you that like you, I maybe delayed too much time to teach my kids how to tie their shoes, but I’ve got an extra “handicap”: they’re both lefties and this implies a real effort when I am right-handed as well as my husband is. Diego hasn’t learnt it, yet, to be honest. 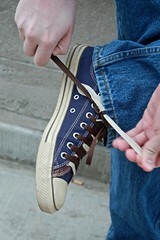 -In kindergarten my daughter wanted sneakers with ties on them and so we practiced tying them before school started. I also remembered my embarrassment at having to put my shoe up on the kindergarten teacher’s chair to have it tied. And I remember teaching my babysitting charge how to tie his shoes the summer before he went to kindergarten. He would always say I tied his shoes funny — I am a lefty whereas he and his mom were not. -I still cut my children’s meat and their pancakes and spread their jam…..this is something I remember feeling very frustrated doing as a child and so I haven’t pushed it. My daughter is 7 and my son is 4. He’s much more interested in trying, which spurs the older one to try too. -Biking alas….we’ve failed there. My son loves to tricycle. My daughter is quite frightened to try to ride her bike. My husband is out shopping for a bike determined that the only way his children will ride is if they go with him. -Homework. The kids do it themselves. As I recently heard one mom say to her son. I have already gone to fourth grade. It is your job to do the homework yourself. My biggest gripe (and I don’t think age ten is too early to begin to sow the seeds of this one) is the importance of etiquette with respect to responding to mobile phone text messages or emails. It drives me crazy that they don’t always take the time to respond with even a simple “Yes”, “OK” or “Thanks”. In retrospect, perhaps my kids didn’t have mobile phones or use email when they were ten years old but it wasn’t long after that that they started to want such things. I blame Facebook for the breakdown in traditional protocol.